The weapons used in warfare are either defensive (helmets, cuirass) or offensive (cold steel, firearms). We will not stop to consider defensive ones, as projectiles from modern rifles go through them at whatever distance an action is engaged. Amongst cold steel weapons we may include the bayonet, the sword-bayonet, the sabre-bayonet, the cavalry sword, the lance. Bayonets have a straight styloid blade with a slender point, two sides (Lebel rifle), and sharp serrated edges. Some are merely a kind of hunting-knife (Germany, Austria, England, Italy). Bayonets are employed as puncturing or stabbing weapons, the direction being specially towards the abdomen or the upper part of the lower limbs. The serious injuries thus inflicted are somewhat analogous to wounds made by pointed instruments, or by those that at the same time are pointed and cutting. During the Balkan War bayonet injuries were very frequently observed. In certain battles they reached a pro- portion of 10 per cent. of the wounded. The injured regions were mainly the body, the abdomen, the upper part of the lower limbs. The sabre or sword, having a blade with hollow sides, straight or curved, is used for stabbing and thrusting in the same way as the bayonet, or as a cutting weapon. The wounds it inflicts are generally numerous (two, four, twenty). They are usually found on the head, the right elbow, the upper part of the left arm. The lance is a pointed weapon that has considerable power behind it. The head of the French lance is 10 centimetres long (5.9 inches) and 2 centimetres (0.7 inch) in diameter; its section is quadrangular. The head of the German lance is 30 centimetres long (11.8 inches) and is 15 millimetres (0.6 inch) in diameter; its section is tri angular. In the attack the point of the lance is directed against the trunk. Wounds by cold steel, rarely observed during relatively recent wars, now tend to increase in number. During the war of 1870 only 600 cases were recorded among 98,000 wounded. They now occur in the proportion of 5 per cent. These comprise rifles, mitrailleuses, guns. The projectiles from these arms are alone of interest to the military surgeon. Projectiles of Firearms carried by the Soldier (Fig. 1). They are projected by means of smokeless powder, which has increased their velocity. At the present time they are pointed instead of conical cylinders. Their calibre has been reduced from 11 to 8, and even to 6.5 millimetres (from 0.43 to 0.31, and even 0.25 inch) (D bullet). Their length, on the contrary, has increased: from 2 calibres it has risen to 3, 4, and even 5 (D bullet). Their weight, on the other hand, has diminished from 25 grammes (386 grains) to 15 grammes (231 grains), to 12.50 grammes (193 grains) (bullet D), to10 grammes (154 grains) (bullet S). Some bullets are of a uniform composition of soft or hardened lead, steel, or copper; others have a protective envelope. The central nucleus of hardened lead is covered by a casing of steel, copper, nickel, or nickel silver, which is either closed or open at the base. We shall only describe the smaller projectiles used by the belligerent Powers. The German S Bullet. - The S bullet of the German Mauser is a pointed cylinder, ogival-shaped projectile of hardened lead, surrounded by an envelope of soft steel plated with nickel. Its cylindrical part hardly exceeds a fourth of its total length; its point, which measures 19 millimetres (0.75 inch), is very tapering, and ends in a very small flat apex, measuring about 1 millimetre (0.04 inch). Its calibre is 7 millimetres (0.28 inch), its length 28 millimetres (1.10 inches), its weight 10 grammes (154 grains). The S bullet is shorter and lighter than the D bullet. The Austrian Bullet, of the Austrian Mannlicher rifle, is formed of hardened lead compressed in a steel wrapper. It weighs 15.8 grammes (244 grains); it is 31.8 millimetres long (1.25 inch), and 7.9 millimetres (0.31 inch) in diameter. It is conico-cylindrical, with a truncated extremity, which is rounded and not tapering. The French Bullet.-The D bullet is of brass, without envelope; it is biogival, the point being very sharp in front, and the bullet truncated at its base. Its calibre is 8 millimetres (0.31 inch), its length 39 millimetres (1.53 inches), its weight 12.80 grammes (197 grains). The M bullet consists of a nucleus of hardened lead surrounded by an envelope of brass and steel. Its calibre is 8 millimetres (0.31 inch), its length 30 millimetres (1.18 inches), its weight 15 grammes (231 grains). The Russian Bullet is ogival in shape, with a blunt extremity. It has an envelope of nickel, surrounding a nucleus of hardened lead. Calibre, 7.6 millimetres (0.3 inch) ; length, 30.5 millimetres (1.2 inches); weight, 13.70 grammes (211 grains). The English Bullet is ogival, with a blunt apex and a casing of nickel. Calibre, 7.70 millimetres (0.3 inch); length, 31 millimetres (1.2 inches); weight, 15.90 grammes (215 grains). The Belgian Bullet. - Ogival, with blunt apex, nucleus of hardened lead, envelope of nickel. Calibre, 7.6 millimetres (0'3 inch); length, 30 millimetres (1.18 inches); weight, 14.10 grammes (213 grains). The Mitrailleuse fires rifle bullets. Use is made of the infantry rifle cartridge. The multiplicity of the injuries inflicted, rather than their nature, distinguishes the mitrailleuse. The military surgeon must be familiar with a certain number of ballistic data in order to understand, from a scientific and practical point of view, the effects of bullets. We shall content ourselves by recalling, and we hope without dryness, the essential data; but it is quite indispensable for him to thoroughly know what we are now going to set forth. Velocity Transit. - A bullet has two kinds of velocity: a velocity of transit, by which the bullet passes through space; and a velocity of rotation, which sustains it during its trajectory. The velocity of transit of a bullet is one of the principal factors of its active force (vis viva), or, in other words, of its power and of its effects. The initial velocity of a bullet is expressed by the number of metres over which it would travel during the first second after leaving the muzzle, were it not subjected to gravity. The remaining velocity, which is of far greater importance for us to know, is the velocity the bullet still has at the different distances of its trajectory. The "remaining" velocity decreases with the distance of the bullet from the muzzle of the rifle, owing to the force of gravity and the resistance of the air. The initial velocity of the bullets now in use is considerable. The German bullet S has the greatest initial velocity, amounting to 860 metres, or 940.5 yards, which is 160 metres (165.0 yards) superior to that of the French bullet D; but the latter, being heavier, retains its velocity better during the remainder of its course; it is thus still very dangerous at distances at which the S bullet is harmless. The French bullet D possesses an initial velocity of 701 metres (767 yards); the M, or the bullet of the Lebel rifle, 651 metres (712 yards); the Russian, 643 metres ,(703 yards); the Austrian, 626 metres (684 yards); the English, 574 metre's (628 yards, etc.). The remaining velocity is inversely proportional to the square, of the diameter of the bullet and proportional to its length and its weight. Velocity of Rotation. -To maintain the bullet on its trajectory, the grooves of the rifle impart to it a rotatory movement. The longer the projectile, the greater its movement of rotation; the latter, however, has but little influence the projectile; it remains constant for the same projectile. Bascule Movements.-The S and D bullets are subject to movements of oscillation and of deflection, to which other projectiles are also subject, but in a slighter degree. Bullets may turn crosswise or with their base in front; this may occur when they encounter a small obstacle in their course, or when they strike the human body. With bullet M, and also with the old German bullet, at 400 metres a fourth of such direction has been noticed; at 600 metres one-third. These overturnings occur more frequently with the bullets S and D, a fact that the military surgeon must bear in mind, as well as the frequency of ricochets. Trajectory. - The course followed by the bullet, its trajectory, was formerly represented by a long curve; the trajectory of modern bullets is straighter, and so increases the vulnerability of the object fired at, and also the extent of the dangerous space. The effect of the tension imparted to the bullet insures a more direct trajectory. Up to 500 metres the trajectory of modern bullets is almost a straight line. Range.-The great speed of the bullets now in use enables them to attain a range of 3 kilometres, or more (3,500 metres - 2.36 miles) in the case of bullet D.
Active Power (Vis Viva). - The damaging effects of bullets are dependent on their active power (vis viva). This is expressed by the formula P = W times the square of V, all divided by 2; W being the weight and V the velocity of the projectile. The following table represents in kilogram metres the initial active power (vis viva) and the remaining velocity of the S bullet, of the Mannlicher, and of the French D bullet: This table shows that the acting or damaging power is practically the same for the three projectiles; it is tremendous at 100 metres, considerable up to 500 metres. From 500 to 1,000 metres the damaging power decreases rapidly; it is very small between 1,000 and 2,000 metres. We thus understand why the classical works on army surgery, when dealing with the effects of bullets, are always careful to bring these effects within touch of the question of the distance at which the firing has taken place, and to speak of very short distances from 0 to100 metres, short distances up to 500 metres, middle distances from 500 to 800 and 1,000 metres, great distances from 1,000 metres upwards. The greater the active power (vis viva), the more extensive are the injuries inflicted. The Power of Penetration of a bullet is dependent on its active power (vis viva), on the extent of the surface on which it strikes, on its density of section-i.e., the weight that prolongs backwards each unit of surface that is opposing resistance. This is the reserve of active molecules. A last condition that influences the penetrating force is the state of its surface of peripheral friction. It follows from the above that the pointed S and D bullets have more power of penetration than the cylindro-ogival bullet with a flat apex; that the D bullet, being longer, has more power of penetration than the shorter S bullet; that a projectile that has ricochetted and struck sideways is less penetrating than one fired point-blank. The resistance, opposed by the tissues to penetration, of projectiles of equal speed, is inversely proportional to the square of the diameters. The bullet exercises on any obstacle it meets a more or less great pressure. The coefficient of pressure depends on the active power (vis viva) and on the calibre of the projectile. The smaller the calibre, the greater the pressure. Ricochets. - Injuries inflicted by ricochetting bullets are very frequent. They are observed in the proportion of 1 in 3 of all cases. A projectile ricochetting from the ground is deflected, and strikes the body obliquely or transversely. It is put out of shape, flattened, turned out of its course, broken up, separated from its envelope, and so the number of injuries to which it gives rise is multiplied. To be put out of shape a leaden projectile must have a velocity of 450 metres, a bullet with an envelope a remaining velocity of 750 metres. The S bullet, formed of hardened lead and covered by its envelope, is more easily put out of shape, flattened, and broken up on striking the ground, than the D bullet, which is made of brass. Injuries inflicted by ricochetting projectiles are more serious than those caused by bullets fired point-blank. Pointed bullets such as the S and D bullets make a puncture-like opening in the tissues when they reach them from a Point-blank discharge. After penetrating, they push the tissues aside, but without greatly bruising them, thus creating very favourable conditions for spontaneous healing. Moreover, they do not carry with them to any great extent foreign bodies derived from the, clothes of the wounded man. These are essential points to bear in mind. When the S and D bullets have tipped over - when they have ricochetted in their course - they strike the body with a much enlarged irregular surface, and so exert strong pressure upon the tissues. Their mechanism then becomes Punch-like, with a tearing and bruising action. Moreover, they carry with them foreign bodies derived from the clothes, and may be soiled by contact with the earth. These are points of paramount importance. The greater the remaining velocity of the bullet and the more tearing its effects (bullets that have tipped or lost their shape), the greater the amount of active force it imparts to particles of tissue it separates. The fragments of tissue torn off play the part of secondary projectiles, which, at first propelled in front of the bullet, whose track they prepare by slipping over its sides, transversely enlarge the track of the wound, giving rise to more or less bruising and disturbance. The intensity of the action of the so-called secondary projectiles varies with the velocity of the bullet, its shape, the nature of the tissues with which it has come into contact, and with the easy dissociation of these last, and their mobility. With pointed projectiles, discharged at point-blank range, it is possible that the abovementioned effects may no longer be seen. At all events, they occur more rarely than with conico-cylindrical bullets having a flat apex, or with bullets having a calibre of more than 8 millimetres (0.31 inch, Gras bullets). On the other hand, they are produced by the S and D bullets when these projectiles become deviated whilst proceeding at a high velocity. This has been observed over and over again in the present war. Intense divulsive and propulsive action is exercised with greater facility the more the tissues are capable of dissociation, the less they show elasticity (muscles), and the freer the molecules (parenchymatous organs, brain). Incompressibility and their frequent projection explain the awful extension of the havoc that at times is wrought by bullets upon organic receptacles (bladder, intestines, stomach, gall-bladder). Not only may these receptacles present enormously enlarged apertures of exit, but they may also burst, and show large openings at some distance from the track pursued by the bullet. The most elastic tissues of the body (tendons, fasciae, aponeurosis), especially when they are movable (tendons of the wrist, of the instep), can transmit for some distance the active force (vis viva) imparted by a bullet. Thus they bruise and split up the neighbouring and less resistant tissues (integuments, muscles). Fragments of bone detached by a bullet act like fragments of the projectile or like the bullet itself, forming a shower of secondary projectiles, which, from the centre of the injured limb, are propelled outwards through the soft tissues. When the active power (vis viva) is of average strength (beyond the 500 metres, and up to the 1,000 metres range), the action of the bullet remains localized. The injury is of the nature of a Puncture or an abrasion, with a weak projection, and more rarely with hard or soft secondary projectiles. Such is the usual normal type of the lesions. When the active power (vis viva) is weak (beyond the range of 1,000 metres), the lesions are still more circumscribed; again, the bullet acts by puncture, and especially separates the fibres of the tissues. 1. Explosive zones (up to 500 metres). 3. Contusion zones (beyond 2,000 metres). Although the above classification has been criticized, it deserves to be maintained for bullets such as those of the Lebel rifle. Projectiles of a calibre greater than 8 millimetres (0.31 inch), in addition to their divulsive effect, have a vibratory action which may be transmitted over a more or less considerable distance from the bullet's course, this vibratory action showing itself by phenomena of inhibition and of local or general shock. With pointed bullets fired point-blank, these phenomena are no longer observed. It may even happen that the wounded, even when their attention has not been taken off by the excitement of the battle, are unaware of the very serious injuries inflicted on them. The S and D bullets pass through the flame of a candle without causing it to flicker. On the contrary, when deflected, the S and D bullets frequently produce this shock. The considerable active power (vis viva) possessed by the bullets now in use enables them to pass through several bodies, and a fortiori through more than one limb. The S bullet fired from a distance of 2,000 metres can still go through two men. The damage extends from the first to the last body or limb traversed by the projectile, if they are near to one another. An active power (vis viva) of 8 kilogrammetres is sufficient to disable the combatant. Contour wounds no longer occur with point-blank firing. The So-called Humanitarian Bullets. - The modern S and D bullets cause a considerable immediate mortality, a fact often too little remembered by the surgeon who treats the wounded in the rear. The fortunate influence exercised by their pointed form and their small diameter is counter- balanced by the frequency of their turning over; this widens the bullet's track from its aperture of entry to its deep resting-place, and gives rise to contamination of the wound by the foreign bodies carried. in by the bullet. Therefore S and D Projectiles are not humanitarian. According to Journée, fatal injuries are in the ratio of 25 per cent., serious injuries 15 per cent., slight injuries 60 per cent. Generally, the same ratio is observable throughout. 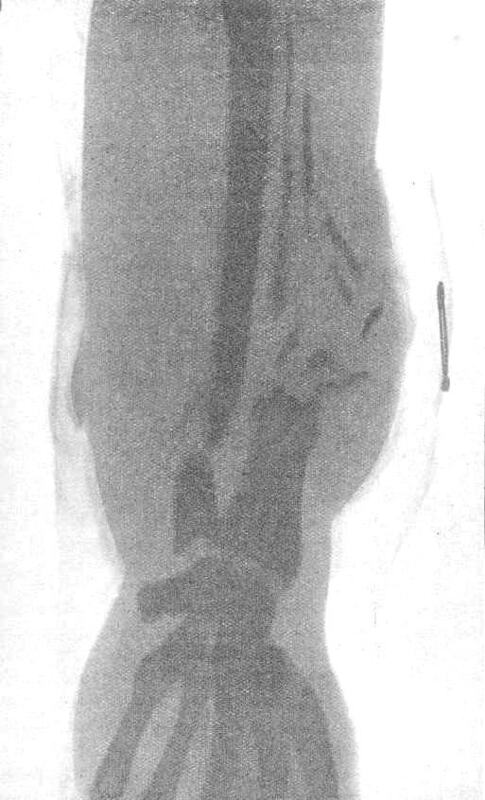 If, in a certain measure, owing to their small calibre, to their pointed shape, and, as in the case of the D bullet, to their composition in a single piece, the present bullets give rise to a long series of slight traumatisms, whose very mildness, when the wounded are taken to the rear, strikes not only the surgeons, but also the general public, there is no reason for bestowing upon them, and on some of those that have been used previously, the so abusively eulogistic German appellation of humanitarian bullets. The average of wounds, other than very small ones of the soft parts, remains grave; therefore we may repeat in regard to these bullets what we have said in speaking of the others: it is truly pushing the love for paradox very far to call humanitarian a bullet that goes through several men when fired from a short distance, and that is capable of causing great slaughter in a zone of more than 3,000 metres. Other things being equal, the extent and severity of the injuries caused by rifle-fire depend on the active power (vis viva) of the bullet. But, far from the distance between the combatants being increased, it has remained unchanged; even it was noticed during the Balkan War, and has already been observed in the present war, the distance tends to decrease, and firing is carried on in zones in which the bullets acquire an excessive active power (vis viva), and the wounds they inflict are amongst the most dangerous known. In short-distance rifle-firing the mortality is appalling. The kind of madness soldiers feel in a charge (furie française) is heavily paid for, and charging would be most criminal were it useless. To appreciate as a whole the gravity of the injuries inflicted by bullets, we must take into account not only those injuries the surgeon sees in patients brought to the rear, but also the wounds that are treated at the front, the patients being subsequently removed to hospital, and the injuries seen on the battlefield in soldiers that have been killed. When all these data are united, instead of one only being kept in view, the impression with regard to the small bullets now in use, far from being favourable, becomes, on the contrary, unfavourable. If all these injuries be taken as a whole, the pointed bullets now in use do not present any essential differences from the projectiles used in former times. Explosive Bullets or Dum-Dum Bullets. At the outbreak of every war there are always questions raised with regard to the employment of dum-dum bullets. It is so to-day. We have seen wounded men in the present campaign concerning whom this old error has been brought forward. The terrible injuries that have given rise to this mistake differ so greatly in character from those usually observed that it seems impossible to attribute them to the action of a bullet which causes but very small apertures of entry and of exit. This, however, is not so. In such cases it is a question of explosive shots due to projectiles of very high velocity becoming more or less broken up in their course through the tissues. The fury with which our soldiers have many times fallen on the enemy, and the fact of their being hit by bullets from very short distances, sufficiently account for these wounds that need no further explanation. Systematic use of explosive bullets would show a want of common sense, because we rely on the effects of ricochetted bullets, a ricochet occurring in the proportion of 1 in 3 of bullets discharged; besides, an explosive bullet can no longer hit a man if it has touched the ground, however slightly.